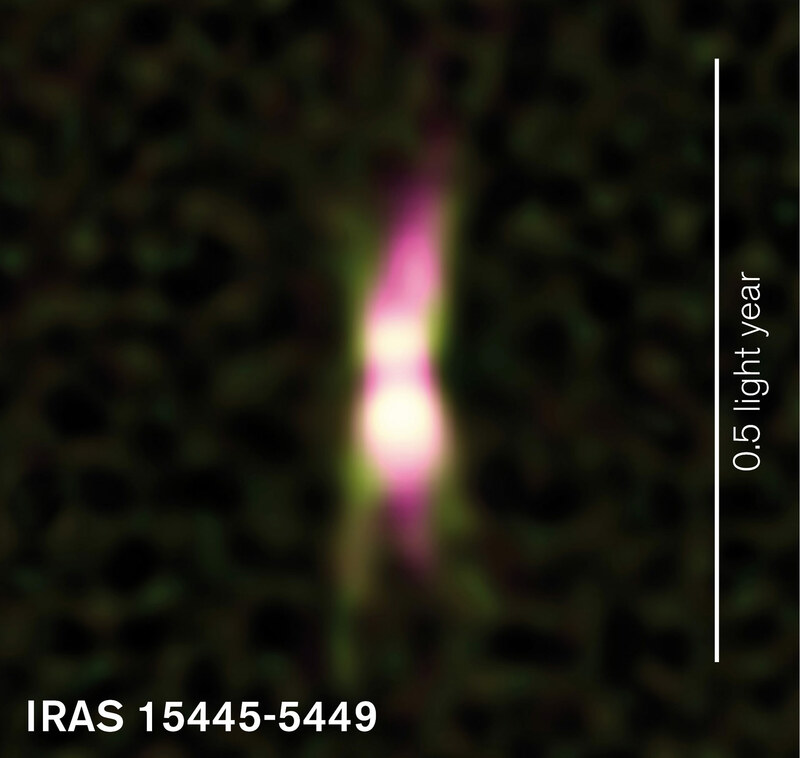 A jet of energetic particles (shown in magenta) is shaping the environment around the star IRAS 15445-5449. Infrared light from dusty material which the jet has already shaped into a symmetric form is shown in green. The star itself is hidden by dust in its environment. Credits: E. Lagadec/ESO/A. Pérez Sánchez. A newly discovered jet of high-energy particles emanating from a dying star has helped scientists better understand how stars begin their final transformation. An international team of astronomers have for the first time found a jet of high-energy particles emanating from a dying star. The discovery, by a collaboration of scientists from Sweden, Germany and Australia, is a crucial step in explaining how some of the most beautiful objects in space are formed – and what happens when stars like the sun reach the end of their lives. The researchers publish their results in the journal Monthly Notices of the Royal Astronomical Society. At the end of their lives, stars like the sun transform into some of the most beautiful objects in space: amazing symmetric clouds of gas called planetary nebulae. But how planetary nebulae get their strange shapes has long been a mystery to astronomers. Scientists at Chalmers University of Technology in Sweden have together with colleagues from Germany and Australia discovered what could be the key to the answer: a high-speed, magnetic jet from a dying star. Using the CSIRO Australia Telescope Compact Array, an array of six 22-meter radio telescopes in New South Wales, Australia, they studied a star at the end of its life. The star, known as IRAS 15445−5449, is in the process of becoming a planetary nebula, and lies 23,000 light years away in the southern constellation Triangulum Australe (the Southern Triangle). “In our data we found the clear signature of a narrow and extremely energetic jet of a type which has never been seen before in an old, sun-like star”, says Andrés Pérez Sánchez, graduate student in astronomy at Bonn University, who led the study. The strength of the radio waves of different frequencies from the star match the expected signature for a jet of high-energy particles which are, thanks to strong magnetic fields, accelerated up to speeds close to the speed of light. Similar jets have been seen in many other types of astronomical object, from newborn stars to supermassive black holes. Right now the star is going through a short but dramatic phase in its development, the scientists believe. “The radio signal from the jet varies in a way that means that it may only last a few decades. Over the course of just a few hundred years the jet can determine how the nebula will look when it finally gets lit up by the star”, says team member Jessica Chapman, astronomer at CSIRO in Sydney, Australia. The scientists don’t yet know enough, though, to say whether our sun will create a jet when it dies. “The star may have an unseen companion – another star or large planet – that helps create the jet. With the help of other front-line radio telescopes, like ALMA, and future facilities like the Square Kilometer Array (SKA), we’ll be able to find out just which stars create jets like this one, and how they do it”, says Andrés Pérez Sánchez. Be the first to comment on "A Jet of Energetic Particles Reveals How Stars Begin Their Final Transformation"